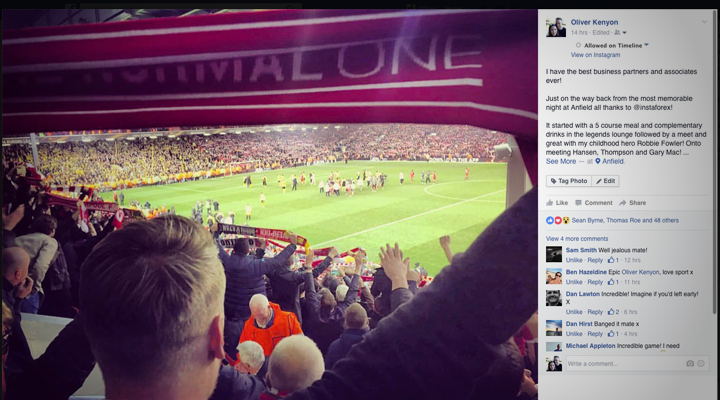 The below was a status I posted on my Facebook wall last Thursday…..
For those of you close enough to know me personally or if you’ve read my previous posts, you’ll likely know by now that I’m a HUGE Liverpool FC fan. I’ve been a lifelong fan of Liverpool, taking after the footsteps of my father who was originally born just outside of Liverpool and who previously had a season ticket in the Kop for many years. It’s basically in my blood and DNA and I still have many family members who live in and around the city. My Dad and I tend to get tickets to a couple of games a season at Anfield, but the tickets are incredibly hard to come by. Thankfully, this week one of my business associates came to my rescue and took the gesture above and beyond my expectations. Let me introduce to you, InstaForex. We’ve been working with InstaForex via AffiliateFix.com on a strategic partnership with their affiliate side of things over the past several months. If you’re not aware of them, they’re one of, if not the biggest and best instant forex trading platform online with one of the most impressive and diversified partner/affiliate programs available. Honestly, it’s well worth signing up and taking a look at what they offer. Anyway, the last of the bullet points is what brought me onto this post and what was quite possibly one of my greatest ever nights on this planet! 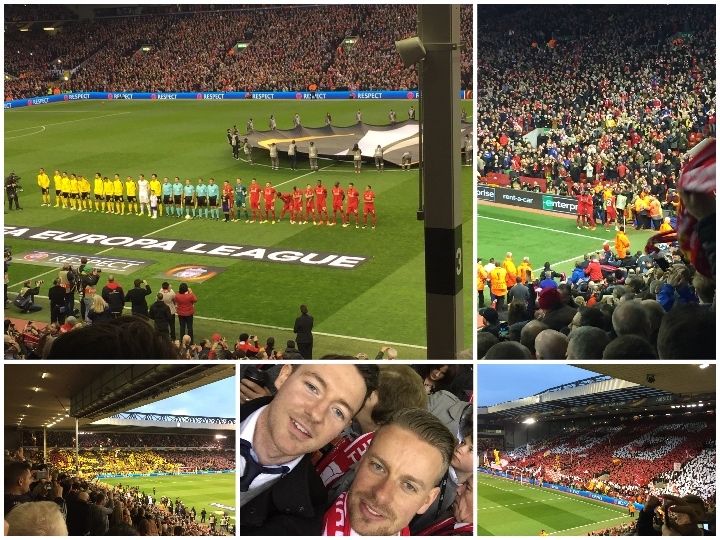 I’ve been to in excess of 30+ Liverpool games in the past 3-4 years; however, I’ve never experienced a European night. The main reason for this is Liverpool hasn’t progressed too far in the European competitions in recent years, and also because if you think everyday match day tickets are hard to get your hands on, European tickets are 10x even harder. So, if you follow football, you’ll know that this year the amazing Jürgen Klopp has taken charge of Liverpool and he’s taken us to the quarterfinals of the Europa League. Now, knowing I didn’t stand a chance of getting tickets on my own, I took a leap and reached out to my partners at InstaForex – knowing they were official partners with the club – to see if they could pull off a miracle and get me a ticket! Did they pull off the miracle? No….they did more than that! Earlier this week, they informed me how important our relationship was to them and, to my utter amazement, confirmed that they had gotten me not one…..not two….not three….but FOUR tickets so that me and my father could go to the game and take a friend each! You couldn’t write what happened next…. 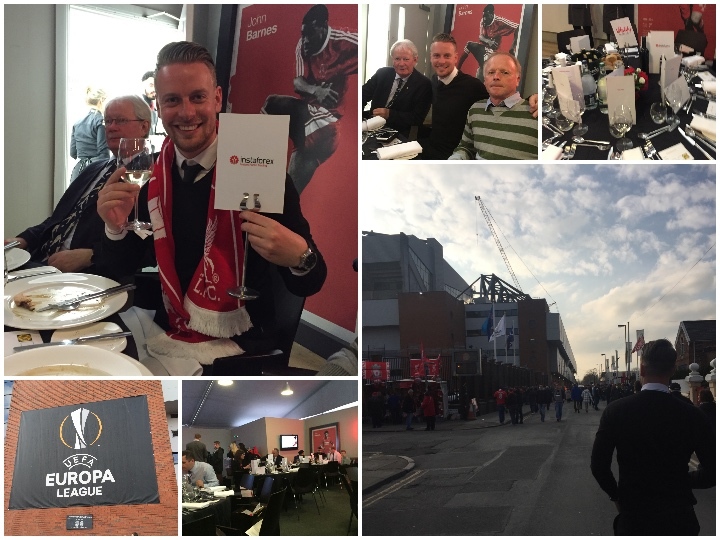 On match day, I received the official invites via the club’s partner program for me, my Dad and our two guests (my girlfriend’s Dad Pete and my business partner Andy). Not only were these tickets to the game but instaForex had also organised VIP (hospitality) tickets for all four of us. The invite told us to arrive 90 minutes before kickoff and to wear smart trousers and a shirt and tie. We all got smartened up and Andy kindly drove us from Bristol to Liverpool, which ended up taking us 5 hours; however, the long journey was soon forgotten when we arrived and went to the marquee to pick up our tickets. We were ushered into the “Legends Lounge” like celebrities and greeted with champagne and canapés. We were then sat at our private table in this very exclusive room with only a handful of other guests. Once at our table, we were given our “goody bags”, which featured a team scarf, match day program, and some other little gifts from the club. 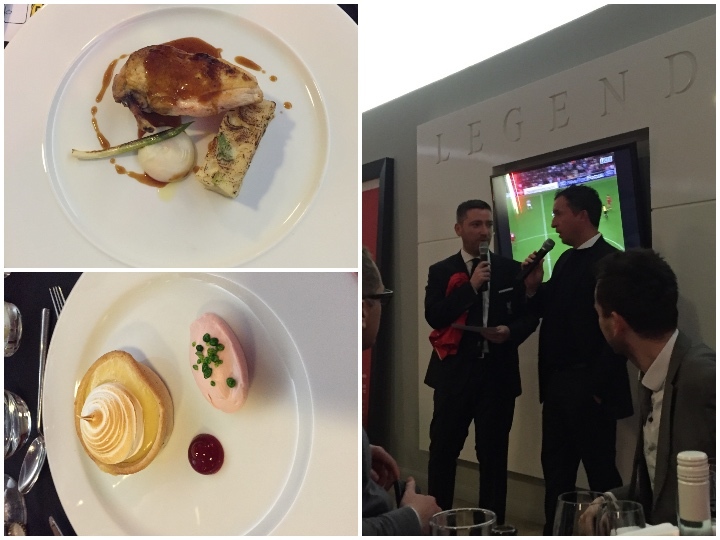 The waiters took our menu choices and informed us that we would soon be joined by Robbie Fowler………wait a second! On the journey up, Andy and I discussed that if we could meet one old Liverpool player (besides Gerrard) then it would be our childhood hero Fowler…..is this actually happening?! Is someone inside my head right now?!?! So not to disappoint, about ten minutes later after more complimentary drinks and whilst we were enjoying our starters, my childhood hero – God himself – walked out and greeted us at our table! Robbie spent the next 20 minutes breaking down his pre-match prediction and answering questions from the room. He then took the opportunity to take pictures with the various parties and have conversations with each table. He was genuinely a lovely bloke to meet and he even took the time to sign our match day programs (me and Andy were like two little pop band fans). After enjoying a very nice 3-course meal and a couple more glasses of champs, we were escorted by the staff out of the lounge and into the directors’ entrance to find our seats in the ground ready for the game, but not before I was able to spot ex Liverpool player and legend Alan Hansen. I think he was a little shocked when I asked him for a photo but was happy to oblige on his way to the ground. 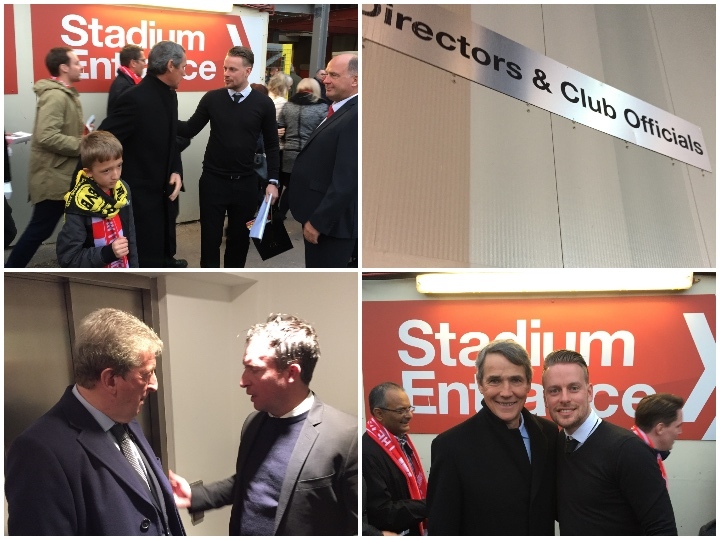 Upon entering the directors’ box, we also managed to catch Robbie speaking with England manager Roy Hodgson and then met Gary McAllister and caught a glimpse of King Kenny Dalglish himself. That would have been enough for me; I was already content grinning from ear to ear but wait……we had a football game to attend! Our seats were great, row 14 so not too far back and with a great view from the centenary stand of both goals. As I’ve mentioned, I’ve been to my fair share of Liverpool games, but the atmosphere last night was turned up that little extra notch being a European night! The night’s opening rendition of our famous You’ll Never Walk Alone was literally incredible to be a part of, every single fan home and away singing the song whilst the players came out on the pitch. So even before the game had started, InstaForex had given me a night not to forget, but I could have never predicted what would happen on the pitch! If you follow football or happened to watch or follow the game last night, you will understand and know that we witnessed one of the greatest games and European nights Anfield has ever seen! Dortmund came out of the gates like possessed men on a mission and I’ve never seen a team quicker to press the ball and break. Their fans were the best bar none away fans I’ve ever seen, and when the Dortmund fans and Liverpool fans in the Kop held aloft the “96” signs for those lost in the Hillsborough disaster, the mutual respect between the clubs was moving! The Germans scored two early goals, meaning Liverpool had to score 3 to win the tie. I was sat there in my seat and after 9 minutes with two goals down thought, “This night has been perfect and way beyond my imagination so far. I honestly think we have a chance to achieve the impossible and get the 3 goals”. There’s something about Liverpool in Europe and I kept thinking back to Istanbul. All I will say is that our fans are by far the BEST fans in the world! At halftime, the rendition of YNWA was incredible and certainly lifted our lads. We came on in the second half and looked absolutely classy. Origi was amazing on the ball and Joe Allen changed the game when he came on. Even when we went 3-1 down and had to do it all over again, we still believed, we still sang, and the ground was still buzzing! We managed to pull 2 back so the scores were level, but Dortmund was still going through on the away goals rule. The big defender headed the win in the 91st minute and I’ve never seen Anfield erupt so much! Even Andy who’s a Southampton fan was chanting his head off next to me with the rest of the home fans! I just knew that this night was special. You don’t get offered VIP tickets the night before the game, meet your childhood hero, meet other legends of the club, and be able to take your family and friends too then have a bad result – I always believed and we won it! We spent the whole walk back to the car chanting our heads off with the rest of the fans and even managed to grab another picture with Phil Thompson! On behalf of myself, my Father, Andy and Pete (Josie’s Dad), I’d like to thank my incredible partners at InstaForex for giving me this once in a lifetime experience on a night that I will probably never ever (but hopefully will) experience again. Be sure to check out all their amazing partner and affiliate options here and sign up to their trading platform for the best instant forex trading experience available! I’m out….time to take it all in and get ready for VillaReal in the semi’s!